What’s this, a lovely new face! Also GOODNESS GRACIOUS it’s quite late isn’t it? It’s nearly Saturday. Sorry for the late update, this page took quite a lot of time to do, and it’s also midterms week, so busy-busy. Hope you can tell the love I put into this page. Gorgeous page! The first panel is absolutely delicious (the buildings, I could drool.). The lady has the snarkiest expression – looking forward to seeing more of her. And Helvetica, your enthusiasm is contagious. Whoo, a new page! I love LOVE your colors. Love how you use them to make your characters pop. The first panel is gorgeous. The one point perspective and the back view of the characters really places the readers right into your comic, as if they are following right behind them. Love it! One tiny thing I’m concerned about is the fore and hindleg of the dog. It’s not a big deal at all and if it’s a artistic style that is fine. Just for future reference here’s a link to an awesome instructor I know of. Marshall Vandruff is an amazing instructor in human anatomy and animal anatomy. 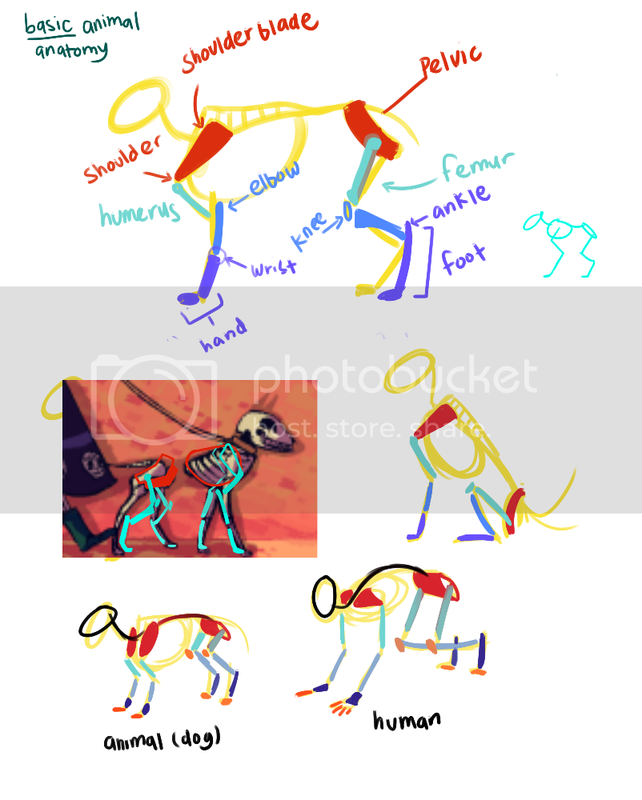 Also if you don’t mind, I just drew up a very basic skeletal structure of a dog/4 legged animals. Sorry for the long comment. Keep up the awesome work! I can tell you put a lot of work into this page. It’s really beautiful! The details colors are great. oh WOW. this page is absolutely beautiful! i wish i could colour like you do, this is just…gah! amazing! also helvetica can i be you when i die please, i want to live in an awesome place like that. I love the colors in this page, and the dog-walker in the 2nd panel actually “pops” out I swear I were looking at something 3D. Out of curiosity, how old/young was Helvetica when he died as I noticed a lot of people refer to him as “cute” and “kid”. If it’s too important a plot detail to reveal now then you don’t have to. Is it just me or does Mr. Good Heavens seem too be more concerned than happy for Helvetica now (he was so enthusiastic before…) ? I have this feeling its not all roses and waffle-frys….. living dead? I like the fourth panel. 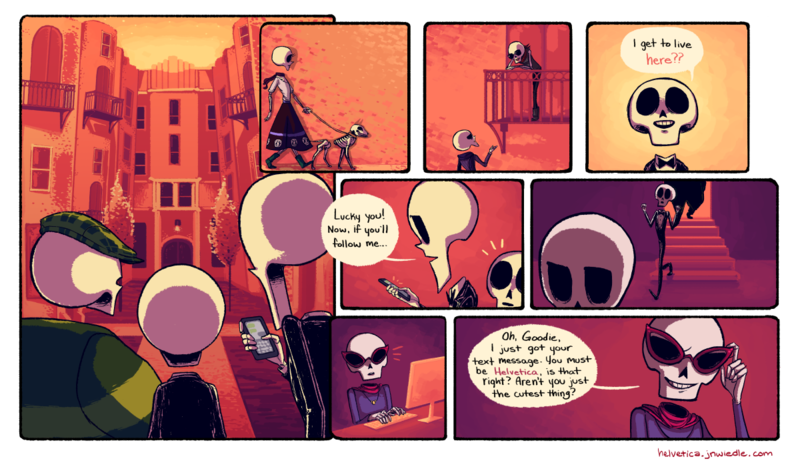 This is the only comic that can make a skeleton look cute! Jesus Christ, those be some fancy digs. There’s gotta be a catch though. Just discovered this comic today. It is like crack cocaine for my eyeballs–and compellingly written, too! Please please continue. Good Heavens that’s a nice iBone! Great job on the comic! I only found this yesterday and I have to say I’m loving it so far!